Bloodborne tops big week of new releases. Last week was a big one for new game releases in Japan, particularly across PlayStation platforms. SCE Japan Studio and From Software’s Bloodborne for PlayStation 4 topped the week of new software with 152,000 sales. The PS Vita version of Sword Art Online: Lost Song followed at 139,000 sales. Combined with the PS3 version, which sold 55,000, the game sold 194,000. One Piece: Pirate Warriors 3 debuted highest on PlayStation 3 at 97,000 sales. Combined with the PS Vita and PlayStation 4 versions, which sold 54,000 and 46,000 respectively, the game sold 197,000 copies. The latest in Square Enix’s Theatrhythm rhythm game series, Theatrhythm Dragon Quest, debuted for 3DS in fourth place at 77,000 sales. 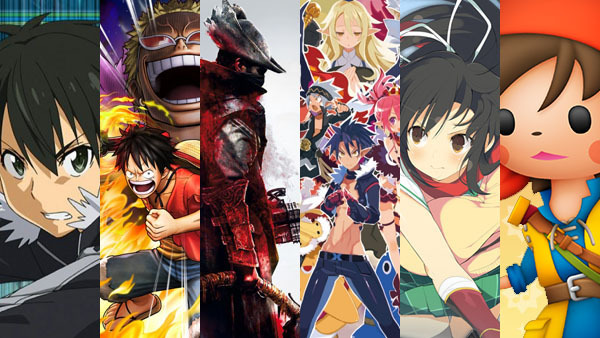 Other new releases this week include Senran Kagura: Estival Versus, which sold a combined 75,000 across PS Vita and PlayStation 4, and Disgaea 5, which sold 23,000 on PlayStation 4. One new release, Deception IV: Another Princess, did not chart at all across any of its three platforms. On the hardware side, PlayStation 4 sales remain strong thanks to Bloodborne and other new releases. And PS Vita sales saw a slight increase due to Sword Art Online and other releases. Everything else remained largely the same.